We have been, as it were, idling rather slowly as we make our way to the designated entry point of the Nekrit Expanse. It might feel like a snail's pace to others aboard the Durant. Be that as it may. I have purposely kept us to warp two whilst awaiting rendezvous with a shuttle from Ocampa. Quite. 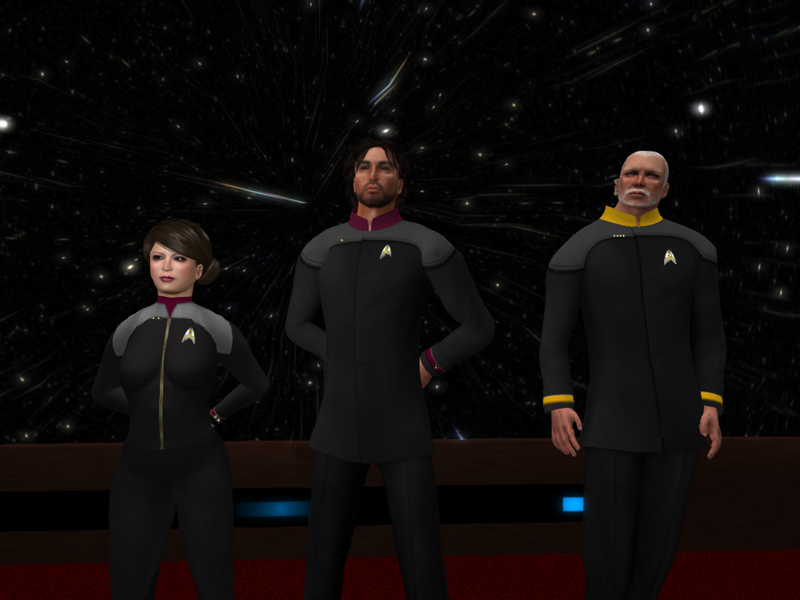 This enforced period of slow progress for the ship in terms of movement, has been excellent for me as its new Captain. I have been able to introduce myself to each duty shift and meet with all available senior officers. We have run several battle drills. No doubt there will be some grumbles from lack of sleep and lack of off duty time. A bit of Chinese whispers, eh? I would have Rear Admiral Skinstad come aboard and see we are tickety-boo and ready to move forward. I am, of course, her Captain, yet she is a Flag Officer and has worked with Commodore Toocool for quite some time. I plan to show both of them my capacity to lead and demonstrate my ability to manage a vessel of this size. It is, rather an honour to be entrusted with the Durant. I am, in point of fact, quite chuffed. I do not plan to let either Po or Cheryl down. Nor, indeed, this crew. I expected some resistance to my command. Despite that, we will forge ahead together. Come what may. Quids in for me if I do well, what? Jim Hode steps onto the bridge. "Status?" Helm: "We have rendezvoused with the shuttle and are awaiting transport of the Rear Admiral." As Cheryl beams aboard her ship she smiles as she sees a familiar face. She looks at her old friend and Chief Security Officer. " Good to be back on board, and good to see you, Mr Broek. I suppose I had better make acquaintance with my new Captain. How have things been with our new CO?" Ishan Broek smiles as the newly minted Rear Admiral appears before him in a haze of shimmering particles. It's been a while since he had seen her due to conflicting periods of leave. "Admiral, welcome aboard...and congratulations on the promotion." He genuinely felt happy for her sterling work being acknowledged. "Captain Hode is settling in nicely,"
Hode straightens his uniform for the umpteenth time. He remains standing, assuming the XO will head for the bridge, not wanting to crease his jacket or pants. He looks down and checks his boots are shining. Rather silly to be nervous, he's the Captain after all. But he feels like Cheryl is a direct line to Poison. Never mind an Admiral. Quite. Mind his P's and Q's, what? He takes a deep breath, "Is she aboard?" Helm: "Yes Sir, she has transported, and transporter room reports the supplies are aboard." Skinstad thinks back to her Academy lessons about William Thomas "Will" Riker . 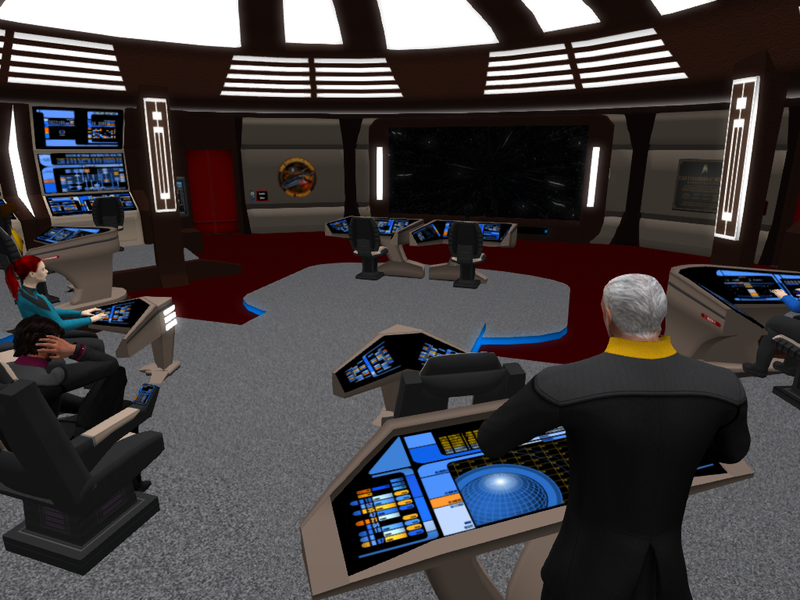 Command of the Enterprise was transferred to Edward Jellico at the order of Admiral Alynna Nechayev. The transition from Picard to Jellico was difficult for the entire crew. She sincerely hopes that this will not happen with her crew and Hode. 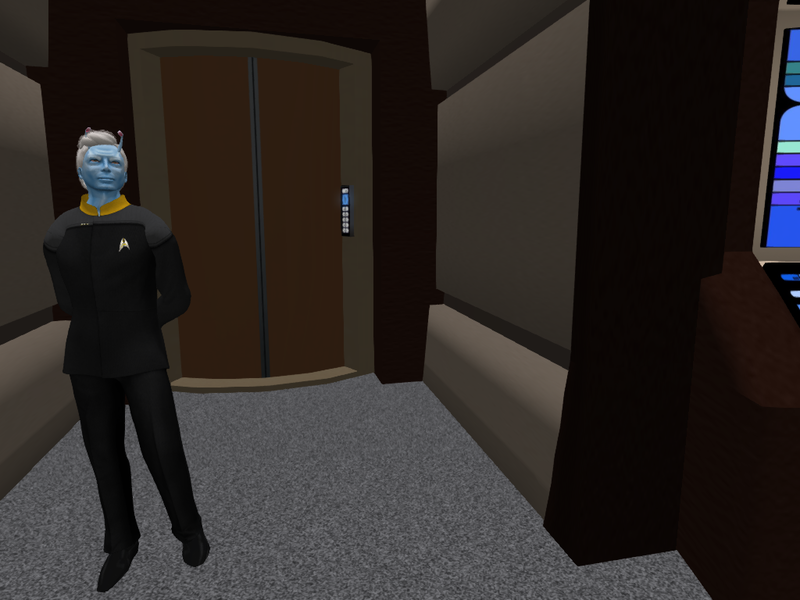 Broek turns to the blue skinned Andorian: "Thank you Mr Allen." Turning back to the Admiral: "Come Admiral, let's get you to the Bridge. The Captain is there." Hode takes a breath. "Acknowledge transport to the shuttle, wish them a safe trip back to Ocampa. Set course for the designated coordinates." Skinstad smiling back at Allen before leaving she says "Thankyou Mr Allen." As she enters the turbolift to the bridge she is very nervous. Broek leads the XO out onto the Bridge and stands to attention before barking, "Admiral on Deck!" Allen waits for the security officer to leave with the XO, and then walks towards the barrels, first scanning them with his tricorder, then signaling a crewman to beam them over to the cargo bay. Hode sees the turbolift doors open and snaps to attention before Ishan even makes his announcement. Everyone looks up. He feels unaccountably like a schoolboy for a brief moment, then he nods to her. "Welcome home, Rear Admiral Skinstad." Helm: "Course laid in, Sir. Welcome home, Ma'am." She pushes some buttons and looks to the viewscreen, waiting for the order to engage. Skinstad: Trying not to look at her Captain's hair she smiles warmly. "Permission to enter the Bridge, Sir." Broek chuckles to himself at the bizarreness of the situation where the XO outranks the CO. It can't be easy for Hode to deal with. He is glad that he doesn't have to deal with that. Allen watches as the cargo is beamed away to the appropriate storage. He turns about to head towards the door, nodding to the other person present 'Good work crewman, carry on', then promptly leaves, heading towards the bridge to report in the addition of the supplies to the manifest. His interpretation of the Captain was that he liked this kind of time consuming activity. Hode: "Granted, Sir. Of course." He remains at attention. He begins his status report: "We had been at warp one to rendezvous with you. We are now setting course for the Nekrit Expanse. I assume you have read the brief and examined the charts in question. All stations report green." 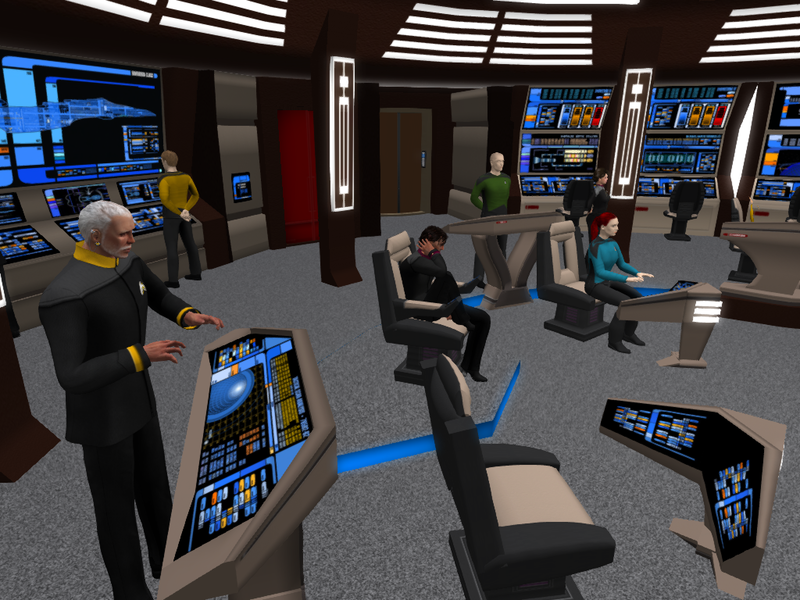 He looks at her keenly and, then glances to the conn, adding, "Helm, engage warp factor four." Helm: "Acknowledged. Course bearing 325 mark 22, warp factor four, engaging..." she puts her hand on the throttle and feels the ship tremble as she leaps forward. Skinstad looks at the familiar face she has been talking to on a view screen. Now the reality hits her really hard that Toocool is not here and this new person is her Captain and closest working colleague. "Yes I have familiarized myself with all the logs Captain. Thank you ." Broek approaches the Tactical Console: "Lieutenant Marshall, you are relieved". Taking up position, he runs checks on security team postings, and checks the manifest of the Ocampan cargo just received is in order. This must be just as difficult for the XO as the CO he muses. It will be interesting to watch this play out. Hode decides since she has not said 'as you were' he will just relax anyway, as there is much to be done. "Mr Broek, how are the adjustments to the shields coming along? Do we have any hope of protecting the ship in the Expanse. Our records state there is an asteroid belt within the anomaly and given the difficulties with sensor readings, we are not sure of its exact location. Engineering, thank you. Mr Allen, please confirm deflector is online and operating at maximum capacity." Helm: "We are now at warp four, Sir." Skinstad looks to Allen and smiles, "Thank you very much. " She feels very awkward at how to make conversation in a meaningful way with her new CO. "I trust we had no more problems with the docking ring when departing this time? We have an Engineer now as the new Commanding Officer. Oh I suppose I should say 'As you were'. " Broek continues running standard systems checks on shields. "Captain, I can report adjustments are delivering efficiency gains of 13% overall. Some emitters are performing better than others, and there are currently two aft emitters being replaced. When that repair work is complete, we will be in good shape." Hode: "Thank you," he smiles, "Commodore Toocool conferred with Commodore Stormchyld and adjustments to staffing on the station were made. The departure routine went very well. I had our command intern take us out, he did a nice job." He frowns. "When will that work be done? We cannot enter the Expanse unless this ship is 100 percent. Right?" He shakes his head, "Have my orders on this not been clear?" He glances to Cheryl with a raised eyebrow, and then continues to brief her: "Admiral I have scheduled a briefing at oh-seven-thirty on the ships chronometer, please add that to your calendar. You will have the conn on Delta shift. I have had my yeoman place the current duty rosters and monthly service reports on your ready room desk." Helm: "ETA to the Expanse, distance at warp four is one hour, forty-two minutes. Sirs." Skinstad decides to try and not be too formal and cause more awkwardness, and thinks that a mission will ease their discomfort around each other. She hopes to settle back quickly into her position as XO. She looks to the Captain and nods. "Aye Sir, 07:30 and Delta shift Conn. I guess I have a lot of PADDS to read on my desk." 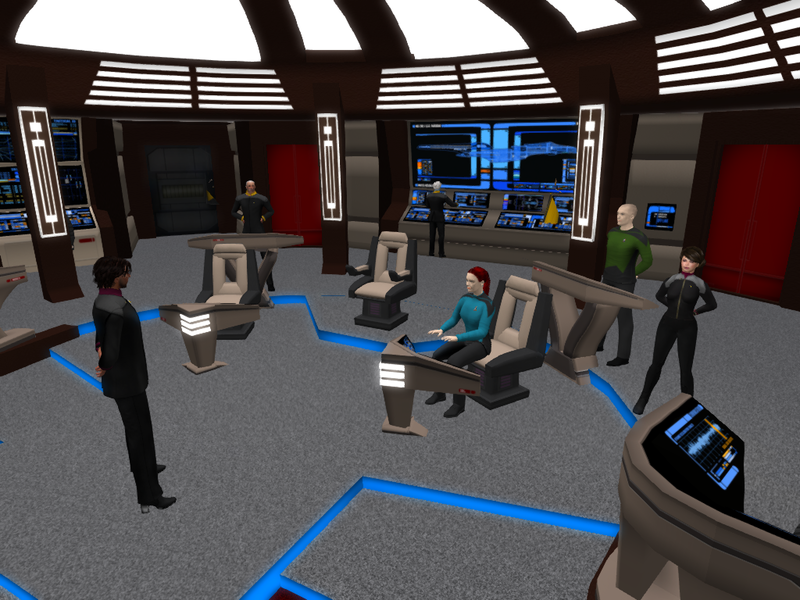 Broek ignores the Captains staged question regarding the clarity of his orders. It seemed to him that was more about nerves and playing to the gallery in an Admiral's presence. "Captain, repairs are underway and the engineering team reports testing is scheduled to take place in the next hour." Allen also doesn't respond to the Captain's question, his teams would be finished as soon as they deemed the job safe, and complete. This wasn't an emergency situation, the modifications would be done for quality, over speed. Hode: "Good, Mr Broek, good," he says in his long British drawl. "I want all department heads to understand we want to pull a blinder here, right? Get into this anomaly, sort out where we need to go, get there safely, obtain the information we need - which could be crucial to Starfleet and the Federation, mind - and get out of the Expanse without a clanger. No faffing about. Quite," he nods. 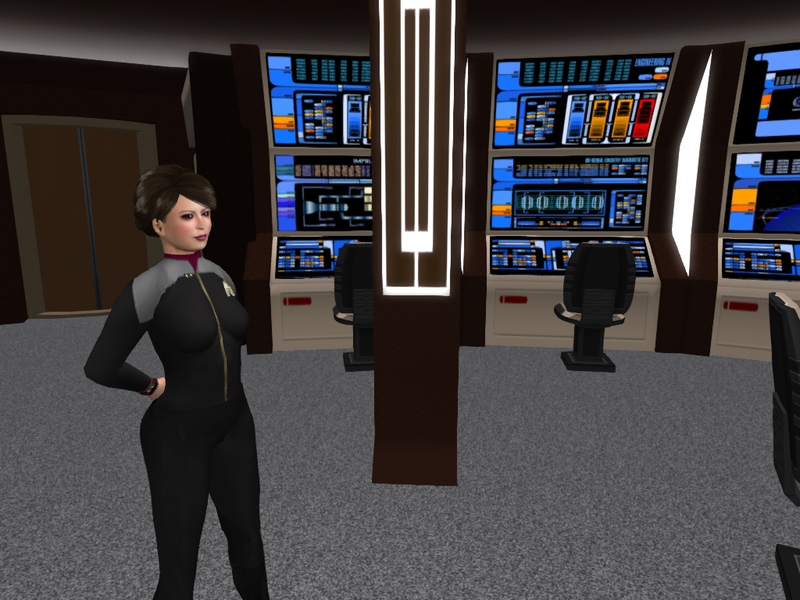 Helm says nothing, but wonders if she needs to use the universal translator to understand the new Captain. She looks up at the viewscreen, puzzled. Skinstad shuffles a little from one foot to the other.. "I hope the rendezvous with the shuttle and myself has not caused any undue tardiness with the mission?" Broek quietly sighs at Hode's use of colloquialisms native to England. "Understood Sir, we will deliver." Allen would make a comment about his crew working more efficiently if they weren't being called to battle drills during the night shift, or having to put down the modifications mid-job to contribute, but given the Captain's recent outburst, he also came around to the conclusion that the Captain was trying to show off to the Admiral. Besides, now that she was back, crew concerns would be reported to her. Hode: "Not at all, Number One. We spent the time executing battle drills and ensuring the ship is in good shape for this mission." He moves to sit down. "Mr Broek, how much time do we need to allot for testing?" Helm: "Ship traffic is behind us now, Sir. Clear path to the designated coordinates. Attempting to contact our probe." Skinstad grins inwardly at the words chosen by her new CO. This is certainly going to be different to Toocool. "Captain. I have been in communication with all Departmental Heads en route from Ocampa. They are all briefed." Broek found his mind wandering. He was back on Bajor, Wyntarra Mas, amongst the Cava groves. He heard his name again...."Providing no issues are found Captain, reports state 90 minutes of dispersal at three 15 minute intervals." Hode: "Good, good. There is a concern regarding the effects of the energy outputs of the Expanse on the brain of humanoids, I believe Doctor Axel has come up with a solution," he turns to look at Ishan. "We are going to be entering the Expanse in - what is it helm? Ninety minutes? We need to have those emitters operational by then. Do what you need to make it so." He nods to Jorden, "Permission to leg it, granted." Helm: "One hour and thirty minutes, aye Sir, at current speed and heading." Skinstad turns to the Captain. "Sir, I have read the report from Mr Axel, and Medical have come up with a solution" She smiles as Jorden requests to move off the Bridge into his 'safe zone'. Broek: "Aye Sir." He knew the testing would be complete in plenty of time. Miracle working was an old trick he had learnt from many a good Engineer over the years. Allen nods 'Understood, sir. Legging it', then hands over bridge engineering back to PO Coil, and walks towards the turbolift. Hode shuffles in his seat. He recognizes the stress he's been feeling all day. He didn't sleep well last night, and not just because of the battle drills. "Are we getting any telemetry from the Durant probe? Tactical, given its speed at launch, can you estimate the distance from the point of launch at this time? I suppose we won't hear much through the soup of the nebula." Helm wipes her face with her free hand, feeling the tiredness sweep through her body. She hadn't had a solid seven hours since Hode came on board. Skinstad senses the stress that everyone seems under. She looks over the Tactical console readouts. Broek gathers some base data and runs a few quick calculations "Hmm, hard to be precise but I'd say 2-3 Light years, but as I say, don't hold me to that"
Hode: "Well, the idea is to follow that probe, it's the only way we'll find a decent course in that pea-souper, right?" Helm: "I'm not receiving anything on the assigned channel at the moment Sir." Skinstad feels very concerned at the tiredness of all the crew members as she looks around the bridge. "I do hope that we can regain communication with the probe?" Broek taps frantically at his console, trying every trick in the book to pick up some telemetry. "Static is all I am detecting, plenty of static..."